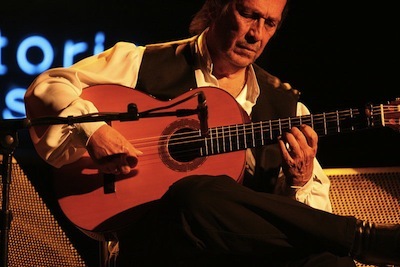 El duende flamenco de Paco de Lucía (The Flamenco Soul of Paco de Lucía) was the title of de Lucía's ground breaking album from 1972. Hundreds of people at his funeral this week and many more around the world mourned the passing of this great soul. De Lucía was loved not just by the flamenco community, but jazz, classical and contemporary musicians alike. It might seem surprising to see him remembered in a maths magazine like Plus, but the music de Lucía brought to world audiences drew us to listen and even learn flamenco. As a past teacher told me, the spirit is able to soar in flamenco because it is firmly rooted in the compás, the rhythm. What was so surprising when learning the different forms was how neatly these rhythms fitted together, like elements of a mathematical structure that played out and interwove through the music. Although this is the base rhythm of a song, complex intricate rhythms are played against it, either with clapping (called palmas) or created by the footwork, often running across and between the pattern, but always resolving to the underlying compás. X . X . X . . X . . X . The difference between the patterns creates a vastly different feel in the music, the seguiriya having a driving quality compared to the celebratory feel of the bulería. This is even more surprising given the two patterns are actually the same, modulo a shift of 7 beats. X . X . X . . X . . X . X . X . X . . X . . X .
X . . X . . X . . X X .
was very similar to an old rhythm, the fandango de Huelva originating from Andalucia in Southern Spain. This discovery agrees with the musical consensus that the fandango rhythm is "the fountain of flamenco music". Mathematicians and musicians alike will continue to be drawn to the combination of the intricate interplay of the rhythms of flamenco and the expressive way they are revealed in the music of de Lucía. There should be an "and" after the 5 of the seguiriya rhythm. ... thank you for spotting that!